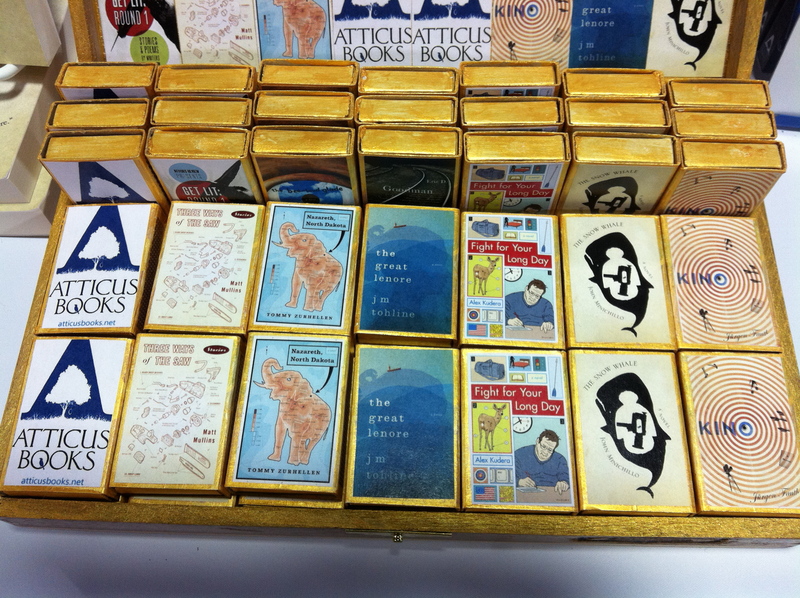 One of the coolest and most popular tchotchkes up for grabs at AWP were the matchboxes featuring the covers of the Atticus titles at the Atticus Books table. These little bad asses went like mad, and though lots of tables had your standard flipbooks of matches, Atticus was the only table rocking true wooden match matchboxes — with our book covers on the top, no less! I mean there’s something about seeing your book cover on a book of matches. Book on book. Each match the story of what it will set alight. Makes you think about kicking it in some damp alley where a Noir Dame asks you for a smoke. You’re leaned up against the alley wall. You pull out your pack of Lucky’s. Shake one out. She draws it slow, lips it. You fire the match and knock back the alley shadows, revealing her to be just as beautiful as you’d thought. She puts her hand on top of yours as you touch flame to the end of this beginning. I’m thinking about such fires because later at the conference I had the good fortune to meet up with my old-soul buddies John Minichillo and Joe Gross, two friends I’ve known twenty years deep. We got to talking up our past. How we once put together the wryly named Cunning Linguists, an improvisational freak space fusion band that only played instrumentals. Being young writer boys in our early 20’s we liked the attendant entendres, that sexual innuendo coupled with the fact of three writer-musicians clank feed-backing our way through a band where we’d utter nary a word. We spent a lot of time in the dank smoke of John’s sweltering attic apartment working out our own weird groove. Indeed, we were wringing all the dish water out of those wastrel salad days. But what of matches you ask? Here goes: One time further down the road Joe and me went to visit John in Mississippi. It had been a few years since the Linguists had jammed at this point, so we got a little session together. We had the candles going, the buzz on. We were working it out, man. Wailing. Joe sqwanking the funky Strat, John doing his crazy stutter shuffle. I’d recently started teaching myself harmonica, and so there I was hunched over and blowing bendy trills. We were kicking things along, and I was totally into it, like I get, transported elsewhere, wearing my freaky paisley polyester jam shirt. Then John looked over at me from across the kit, a serious furrow to his brow. “You’re on fire!” he shouted at me. Hell yes, my man John could tell I was in deep. I grinned. I was on fire. He was feeling me. He was picking up what I was putting down. I gave him the power fist and dug back in. Sent the moan up into the aether. “No, man! YOU’RE ON FIRE!” he screamed again. It was great to be reminded of that old fire during a weekend where I felt a new fire. The weekend when my book was released and I had the pleasure of being able to hand it to my good old friends. So here’s to being on fire with music and words. Here’s to tiny book covers on the tops of boxes of wooden matches! Fire it up, people. Fire it up. Sawing Away in Madison, IN. Babies – Saw – Man!